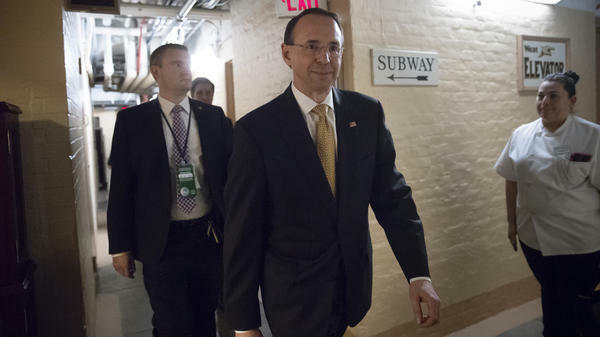 Deputy Attorney General Rod Rosenstein departs the U.S. Capitol through a basement corridor after House and Senate lawmakers from both parties met in a secure room for a classified briefing about the federal investigation into President Trump's 2016 campaign, in May. The embattled second in command at the Justice Department — who is in primary command of the Russia investigation — went to the White House on Monday expecting to be terminated, as NPR's Carrie Johnson reported. But that didn't happen. The account in The New York Times from the previous Friday, as discussed last week, ultimately was not a sufficient tripwire for a president who made his national brand in the firing business. Explanation, Vol. 1: Some reports suggested Rosenstein might simply have misjudged the seriousness with which President Trump viewed the Times report, especially in a week in which the president's attention was in such heavy demand elsewhere — first at the United Nations and then in the Senate Judiciary Committee. "I would certainly prefer not doing that. There was no collusion. There was no obstruction. I mean, unless you call obstruction the fact that I fight back — I do fight back, I really fight back. I mean, if you call that obstruction that's fine. But there's no obstruction. There's no collusion — I'm going to meet with him tomorrow. I may call Rod tonight or tomorrow and ask for a little bit of a delay to the meeting, because I don't want to do anything that gets in the way of this very important Supreme Court pick. So I don't want it competing and hurting the decision, one way or the other, decision. "Again, I want to hear what she has to say, but I don't want to do so — I may delay that. I'm going to see. I don't want to do anything that's going to conflict with that. But my preference would be to keep them and to let him finish up." There were two points of interest in Trump's answer. The first was that he connected Rosenstein — and his fate — directly to the Russia investigation and what Trump calls its lack of merit. But the second was that the president said he wanted to "let him finish up," suggesting that Rosenstein is safe until he and special counsel Robert Mueller finish their work. The next question is: When might that be? Rob Goldstone was the last link in the chain of communication that started with the Russian government and ended with Donald Trump Jr. As every pupil knows, a Russian attorney talked with billionaire Aras Agalarov, who talked with his son, singer Emin, who talked with Goldstone, who pinged Trump Jr. in a now-famous email. Goldstone now says a key detail in that much read, much dissected email was something that he made up: the detail about the "crown prosecutor of Russia" having been the one who talked with Aras Agalarov. Goldstone told NPR's Miles Parks he was just trying to inflate the importance of the person who had set the chain of events in motion that led to the subsequent meeting in which Trump Jr. and other Trump campaign leaders hosted a delegation of Russians at Trump Tower. Meaning what? If what Goldstone is saying now is accurate — as opposed to what he said at the time in his message — how much does it change the story of the Russia imbroglio? In terms of the substance and the potential political consequences, not much. But it may say something about the tradecraft involved. In reading Goldstone's email at the time Trump Jr. released it, many news organizations and analysts — including NPR — concluded that what Goldstone was describing, in his own way, was a meeting between the elder Agalarov and Russia's federal prosecutor, Yuri Chaika. That put the genesis for the outreach from the Russian government to the Trump campaign at the highest levels of the Russian government, and within a box within the organizational chart connected to Russian President Vladimir Putin. That another lawyer was involved, especially if it was Natalia Veselnitskaya — the one who wound up flying to New York City for the meeting — pushes the involvement of the Russian leadership further away. But overall, Goldstone's account in a new book does not ameliorate the political and potential legal danger for the family Trump. How so? If the Russia imbroglio is nothing else, it's a story about how Trump Jr. and his other top counterparts may have accepted political dirt from a foreign government. At the time, Veselnitskaya gave an account of what she called illicit money from Russia that she said was working its way into the Democratic National Committee, according to what people have said since. Trump Jr. says he took no action with that information, having expected easier-to-exploit dirt about Hillary Clinton. Nonetheless, he received it. President Trump has acknowledged that the meeting was to get information on the campaign's opponents but has said that was "totally legal." Goldstone, meanwhile, wants out of all this. He told NPR's Parks he didn't know whether the Trump campaign conspired with the Russians who attacked the election but if that happened, it took place between those two sides. Trump Jr.'s phone calls with Emin Agalarov were what arranged things, as Goldstone pointed out. He was not a party to it, he says. So no matter what else happens in this imbroglio, Goldstone says his chapter now is closed. He wants to move on. What remains to be seen is whether Mueller will permit that. 2018 has been the year of the paper war and members of Congress are reloading their weapons for another salvo. On Thursday, the House Judiciary Committee announced that it has issued a subpoena to compel the Justice Department to produce the memos that former FBI Deputy Director Andrew McCabe kept about his dealings in the Trump era. McCabe followed the lead of then-FBI Director James Comey, who began writing notes about every interaction he had with Trump after their first meeting in New York City. McCabe's notes reportedly included the reference to Rosenstein's discussion about secretly recording Trump and who knows what else. So Judiciary Committee Chairman Bob Goodlatte, R-Va., wants that material. The following day, his compatriots on the House intelligence committee voted to release a number of transcripts of interviews the panel had conducted before concluding its Russia investigation earlier this year with a finding of no wrongdoing. Republicans, led by Chairman Devin Nunes, R-Calif., voted to ask the Office of the Director of National Intelligence to declassify 53 interviews, from Akhmetshin, Rinat — the Russian-American lobbyist who attended the Trump Tower meeting — to Yates, Sally, the former acting attorney general who warned the White House about former national security adviser Mike Flynn. The material from the House Republicans may not appear for some time, but once it goes through the executive branch screening, look for another blizzard of evidence in the Russia imbroglio.